Simon & Schuster, 9781439148914, 368pp. Readers of The Quilter’s Apprentice and Round Robin have been enchanted by Elm Creek Quilt Camp, where women gather each year for quilting, friendship, and fun. 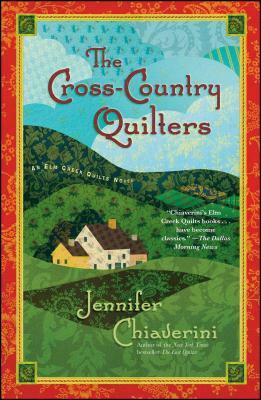 The third in the Elm Creek Quilts series introduces the Cross-Country Quilters, a group of far-flung friends who pledge to complete a “challenge quilt”—symbolic of each woman’s personal goals—in one year’s time. These five women arrive at Elm Creek Manor hoping to find in their quilt lessons an escape from the problems they left at home. Julia, an aging starlet, has pinned her hopes to a plum role in a historical epic whose director is under the mistaken impression that Julia already knows how to quilt. Megan is a successful engineer who has won prizes for her miniature quilt designs. The one challenge she has yet to master is single motherhood. Donna, a mother of two, must hasten to teach her daughter independence and self-esteem—lessons she, too, must take to heart. Grace is a renowned curator of antique quilts, whose creative flair is waning for reasons she is unwilling to reveal—even to her closest friends. Vinnie, the senior member of the group, is a sunny soul with a tragic past. Her overwhelming desire is to bring happiness into the lives of those she loves. Although the Cross-Country Quilters share a common creative goal, as the year goes by their bonds are tested by the demands of daily life. But despite differences in age, race, and background, the friends' love for quilting and affection for one another unite them in a patchwork of caring and acceptance. The quilt they make reminds them of an everlasting truth—friends may be separated by great distance, yet the strength of their bond can transcend any obstacle.